Whether you work in an office or on a construction site, there is always a chance that you could be injured on the job. According to the Bureau of Labor Statistics (BLS), more than three million nonfatal occupational illnesses and injuries were reported in 2013. Because they keep detailed records of each and every incident, the BLS also knows how people get hurt at work. With that in mind, here are the most common occupational injuries in America. Although Americans are generally more sedentary at work than ever before, that hasn’t stopped them from getting hurt. Nearly one-quarter of all occupational injuries involve overexertion in lifting or lowering. Whether the object that is moved is a box full of office supplies or a jackhammer, these injuries can cause short or long-term pain. According to official data, most of them involve a back injury. While it may be more dangerous to fall on a construction site, a tumble in any environment can, and often does, cause an injury at work. Knees, ankles, feet, and hands typically sustain some damage when a person falls onto a hard surface. Often caused by distraction or carelessness, falls can be prevented in most environments. You might predict that these types of work injuries only happen in environments where wet floors are commonplace, such as supermarkets, cruise ships, and warehouses. The truth, however, is that they can happen anywhere. If, for example, you work in an office where people leave things lying around, someone could trip over an object and hurt themselves. They could also slip and fall on a spill that someone neglected to clean up in the break room. 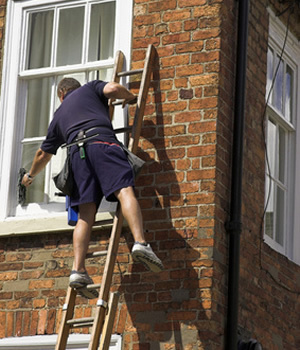 Slipping and falling off of roofs, ladders, or down staircases almost always results in injuries. In many cases, the injury will require medical attention. Because of the impact, ankles, knees, and back are the most frequently injured body parts when a person falls from an elevated surface at work. The only way to prevent employees from getting injured at work in this way is to be more cautious and careful in dangerous environments. Workers can also reduce their risk of serious damage by wearing the proper protective gear at all times. According to the BLS, a troubling four percent of work injuries are caused by violence. Once again, these incidents can happen in any occupational environment, from an office to a classroom or a retail store. The only effective way to guard against violence is to deal with disagreements and disputes between employees before they get out of hand. The more you drive, the greater the chance you will be in an accident. For businesses with commercial vehicles, auto accidents are an often unavoidable fact of life. That does not, however, mean that the risk of these work injuries cannot be reduced. In addition to training drivers, businesses should make certain that their fleet of vehicles is relatively young and equipped with the latest safety features. Whenever something heavy — or even not so heavy — falls from a height and lands on an employee, there is a high chance he or she will be injured at work. The damage may range from a few bumps and bruises to a serious wound or even a concussion. While it is true that these accidents occur far more frequently in warehouses, supermarkets, and other places where heavy items are routinely stacked, they really can happen anywhere. As a result, it is often a good idea to avoid placing anything heavy on a high shelf. This may not be possible in a warehouse or supermarket, but it can easily be avoided at an office. Because today’s workers are doing more sitting and typing than ever before, repetitive motion injuries have grown increasingly common. Carpal tunnel syndrome, vision problems, and back pain affect a large number of office workers in America. While not acute injuries that require immediate medical attention, these often chronic problems can cause employees to miss work. Better training, timely breaks, and ergonomic equipment may help reduce the risk of injuries at work due to repetitive stress and strain. With proper training, equipment, and support, employers can help reduce the risk of injuries in the workplace.